Due to popular demand, we’ve added support for Chanukah candle-lighting times. If you specify a city for Shabbat and Yom Tov candle lighting times, you’ll see Chanukah candle lighting show up as a timed event. 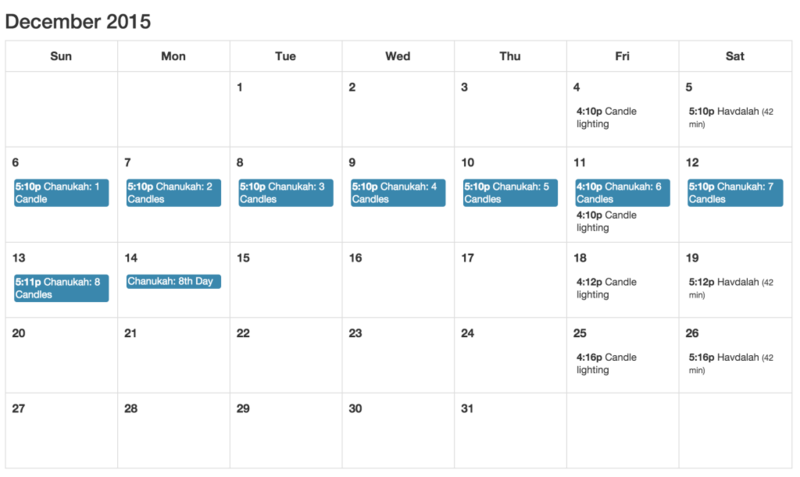 If you don’t enable candle-lighting times (and instead choose the generic Diaspora or Israel locations) you’ll see Chanukah events show up as all-day (untimed) events reminding you to light candles that evening. Candle-lighting times should show up on all iCalendar feeds (Google Calendar, Microsoft Outlook, iPhone, etc) when the application refreshes Hebcal events. This could take up to a week for the refresh, depending on the app.